For those of us who are self-taught and seek the self-discipline to not just goof around during our daily practice, Hal Leonard’s Ukulele Aerobics provides a treasure trove of daily exercises to work on. I own the guitar version of this book and love it for all the same reasons. 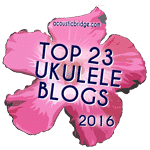 It alone fills a niche among ukulele books between lesson material and songbooks. My problem with lesson books is that they’re usually half full of songs that I’m not really interested in. So I tend to buy song books (I have a bunch of great fingerstyle song books listed at Fingerstyle Ukulele Resources). Learning songs is fun and certainly will advance you as a player, but there’s something to be said for drills. One thing that concerned me about this book when buying it was the “from Beginner to Advanced” in the title. I’m no beginner and wondered if half this book would be wasted on me. I’m happy to report that, while a few of the exercises towards the beginning are very easy for me, there are still plenty mixed in even towards the beginning that offer a challenge of some sort. For example, I’ve found some of the scale exercises are easy to play going up, but I’m having to train my fingers to play them going down. And since I play fingerstyle, many of the strumming exercises fall outside my usual playing style. More than anything, this book ensures that your practice sessions aren’t too narrowly focused, and that’s of great value in improving as a player. That said, I must say that the title of this book is a bit misleading. It is not for the true beginner. I gather most beginners will find this book too challenging and the pace much too fast. This content is better suited for intermediate players and “advanced beginners” – someone who is comfortable with the basics of the instrument and can read tablature without too much struggle. The book comes with a CD (and the Kindle version with digital audio) of each exercise being played. I’ll be honest, I haven’t listened to it at all, but I gather it would be useful if you’re unsure of the timing or subtleties of how some of the exercises should sound. Notation is a tricky beast. Whether you’re practicing on your own or teaching others, this book provides an excellent set of ukulele playing techniques that offer a solid understanding of the full scope of playing techniques. You can buy the book at Amazon in print or Kindle versions.